Whilst perusing the local farm shop I spied Snyder’s of Hanover Peanut Butter Pretzel Sandwiches, and like a moth to a flame I naturally had to buy them. At £1.99 they were a little pricey but it’s a price I’m willing to pay for a peanut butter goodie. Golden with that classic pretzel sheen the pretzels were crunchy and a little salty. 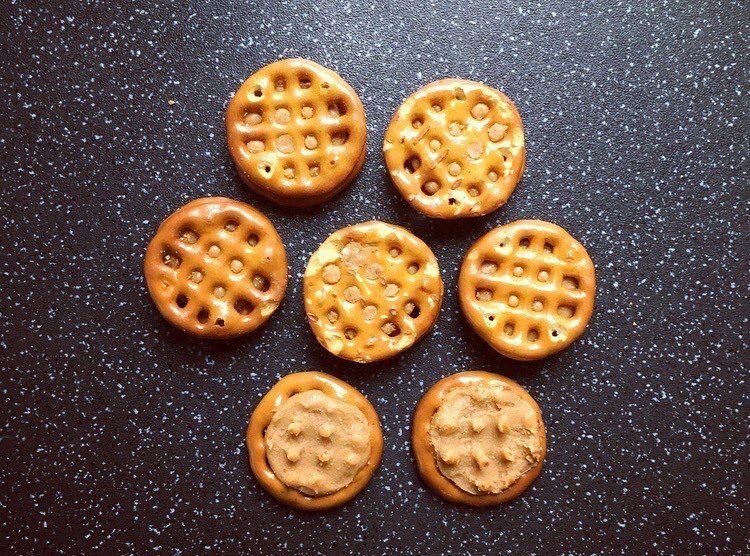 Sandwiched in-between each pretzel was a thin layer of salty peanut butter, not the fake pumped full of goodness knows what ingredients, but natural creamy peanut butter, and boy what a difference it makes. I am always a tad apprehensive with honey, a smidge too much and it completly takes over, but here you can’t taste the honey per say but there is just a touch to offset the saltiness from the pretzels and peanut butter filling, giving it just a little sweetness. As a sandwich the pretzel is the dominant and the peanut butter is more of an undertone. I’d like to see a smidgen more peanut butter and a bit more consistency in the sandwiches, given there were quite a few that were apart. That said they are still delicious and do hold a nice flavour combination of crunchy salty and sweet. 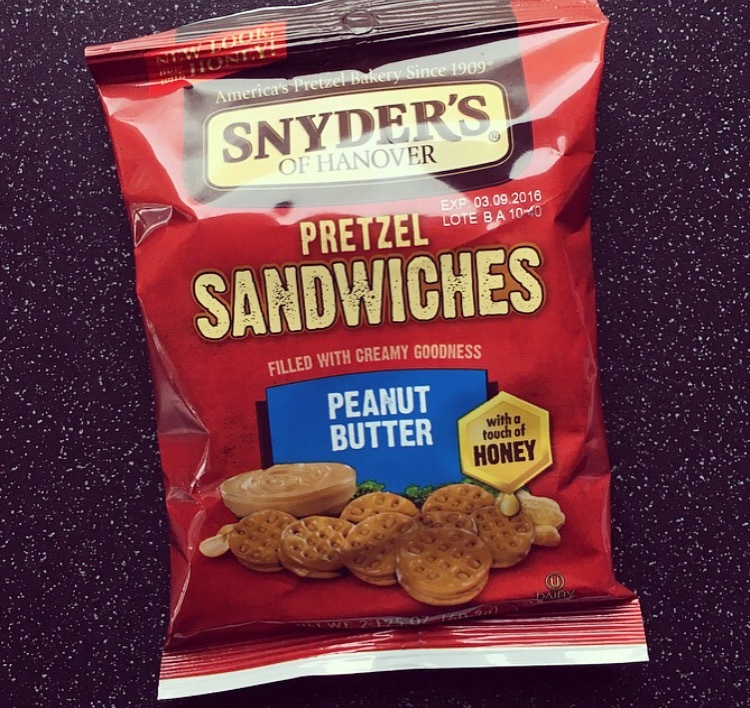 These Snyder’s of Hanover Peanut Butter Pretzel Sandwiches are rather moresish and are the perfect snack, before you know it you have eaten the bag.. oops. I haven’t seen these before but after looking online it appears they do a whole array of exciting pretzel snacks, I’m particularly intrigued by the Pretzel Poppers Cinnamon Sugar and Sourdough Pretzels, but I do wonder if this is the US only. Certainly though the Peanut Butter Pretzel Sandwiches get a thumbs up from me and I would definitely buy them again. I bought a bag of the Syders of Hanover peanut butter sandwiches and loved them. 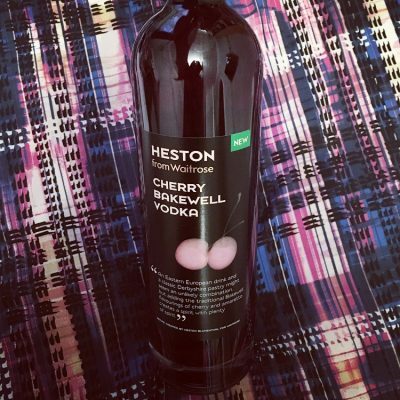 I wanted to buy more but when I went back to the grocery store there were no more. I searched three (3) grocery store and I also went to Walmart. None. All of the other pretzel sandwiches were in each store but not the peanut butter ones. I live in Florida so we have a Publix, Winn Dixie and a Hartis Teeter grocery stores. Those peanut butter pretzel sandwiches were so good. I just can’t find them anymore. The salted caramel ones are my new obsession! Totally delicious! Yes, they are sooooo good. 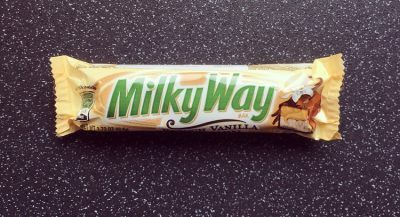 I bought some from an online American store a few weeks ago and have been obsessed ever since. Im currently on my seventh bag! I highly recommend!